Four dial lock keeps your bag securly locked, but available to screeners. 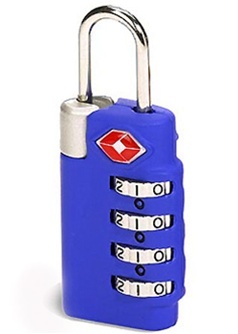 This TSA approved combination lock has a forth dial for added security, but can be safely opened by airport TSA inspectors. Attractive blue and chrome colors helps you quickly identify your bag. Transportation Security Administration (TSA) baggage screeners have a secured set of codes and tools to open Travel SentryTM Certified locks when necessary for inspection...without damaging the lock.